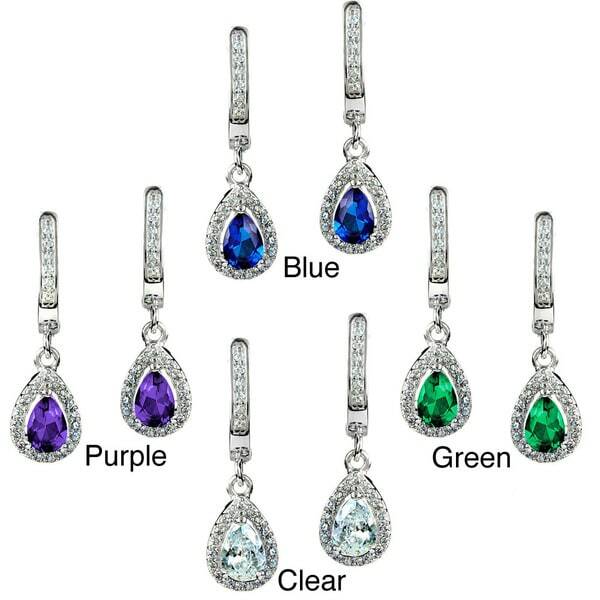 These stunning sterling silver earrings feature pear-shaped cubic zirconia center stones in your choice of white, blue, green or purple color options. Halos of smaller clear cubic zirconia rounds encompass the center stones on these dangle earrings. All carat weights and measurements are approximate and may vary slightly from the listed dimensions. Treatment code CR. See Treatment Guide for further information. These earrings were exactly what I was looking for to wear to a wedding. I bought the clear ones. They are very classy and elegant looking. However, when I took them off after wearing them for around 5 hours, one of the earrings wouldn't stay closed. It kept flopping open. Nothing I did would enable the earring to click closed. So while the earrings looked very nice, they broke after one use. Maybe I just got a bum pair.